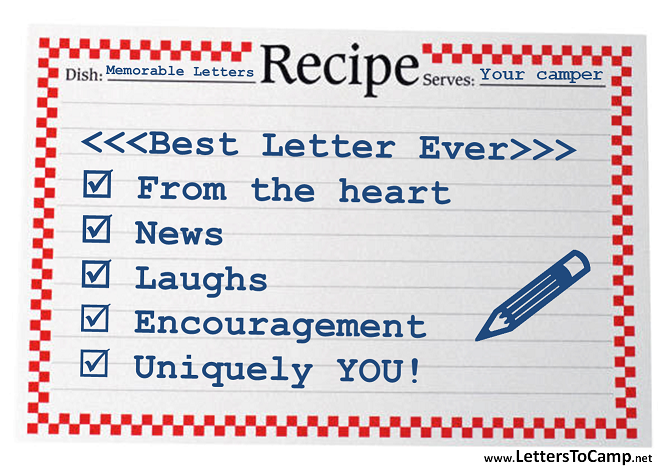 One of the best ways to amuse your summer camper is to include a joke or two in your letters and emails. Following is our updated list of kids joke sites, most of which have clean jokes that you can send to your younger campers. That very most dreaded Monday morning has arrived. Not because of work. Or the start of another week. Or that important appointment. Or because your in-laws are stopping by. 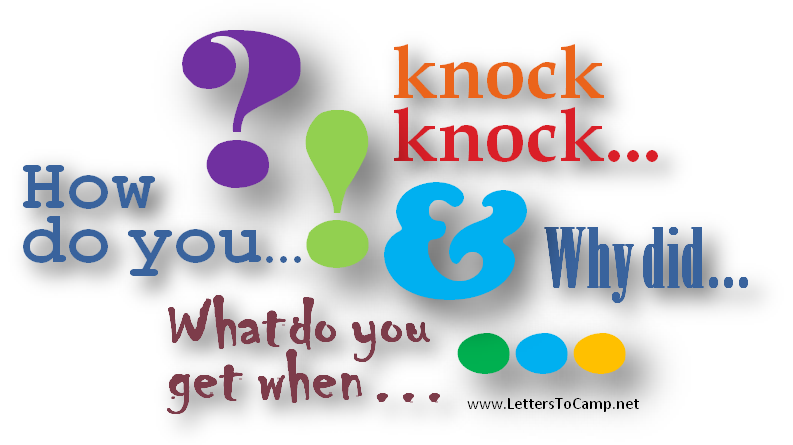 No, today is dreaded because you have to write YOUR VERY LETTER TO YOUR OVERNIGHT CAMPER! It seems like if it’s June, it must be time to drive up to camp for dropoff. Today was that day for one of our kids who is a counselor this year. The last few days have been filled with shopping for clothes and supplies, the ever-running washing machine and filled laundry baskets, lots of activity, packing, packing and more packing, and counting down the days, all of which culminated with last night’s final family meal, followed by the precious final hours in unrestricted tech immersion (sitting in front of a computer screen, watching videos, catching up with friends etc). Recently a friend shared how her family’s roadtrips were unique. Turns out that instead of playing the license plate game or losing themselves in their iPhones, her family reads stories to each other. They take long roadtrips so we’re talking about whole books. Her family looks forward to their unique way of taking roadtrips. Each roadtrip reinforces the family’s unique and fun traditions. Sometimes, to do something different, sometimes you have to do something less. Less typing, less writing – i.e., fewer letters. As in fewer alphabet letters. Abbreviations can be a god-send for parents with way too much to share in just one page (that’s the limit at our camp). And kids love the texting abbreviations they use with their friends too. Not that they’ll want to share with you. But they may get a kick out of an abbreviated email from you. Or not. But you won’t know until you try… WTG (way to go)! Sup? We’re having a good summer so far IMHO – even though it’s lonely without u. WBU? How is camp? R u having fun meeting new kids? What’s ur favorite activity? OATUS, Sparky the dog was chasing his tail last night and it was so funny Dad and I were ROFL. LOL, it was funny! SFSG with his potty training – no mess yet. LOL! BTW, IDK about u, but IDC if I ever have turnips again because they are gross! JK – As if I’d ever ever eat turnips! B4 I forget – wtg on winning the swim meet! What’s up? We’re having a good summer so far in my humble opinion – even though it’s lonely without you. What about you? How is camp? Are you having fun meeting new kids? What’s your favorite activity? On a totally unrelated subject, Sparky the dog was chasing his tail last night and it was so funny Dad and I were rolling on the floor laughing. Laugh-out-loud, it was funny! So far, so good with his potty training – no mess yet. Laughing out loud! By the way, I don’t know about you, but I don’t care if I ever have turnips again because they are gross! Just kidding – as if I’d ever ever eat turnips! Just to let you know, Dad and I are going on a trip to NYC next week to see what it’s like to be in a small city. Oh my god I am so funny. No matter, that was lame. Whatever… Anywho, we’ve got to go, so I’ll say bye bye. But I still love you. B4 I forget – way to go on winning the swim meet! For many northern camps, today is the Monday morning after visiting day or the day after second/third session drop-off. 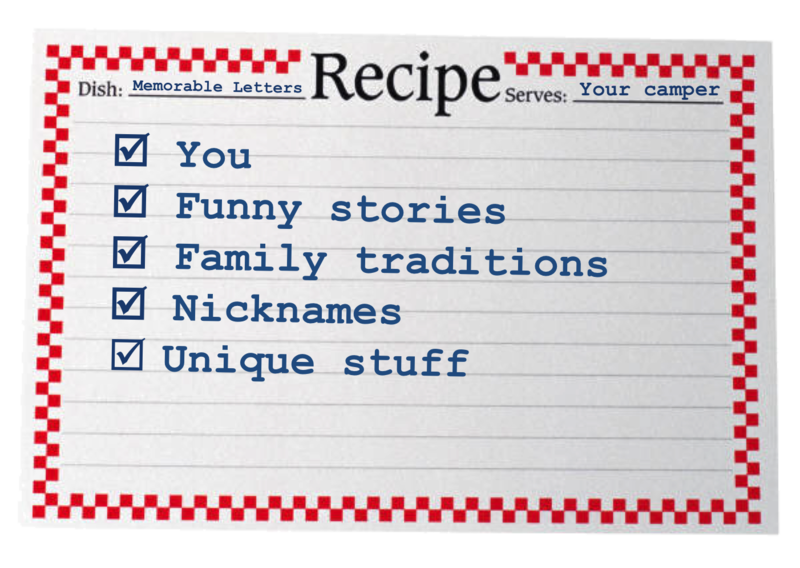 Since this Monday can be a challenging one for many parent letter-writers, we’re taking a break from the usual suggestions on what TO write to your camper. Instead, take a look at the following letter to see a few obvious pitfalls to avoid (at least we hope they’re obvious!). See the bottom of the post for more on what TO write. When I was growing up, kids didn’t have the constant electronic tether to their parents that they do today. It caused the inevitable problems of course – for instance, never knowing where my brother was at dinner time (and having to call everyone in the neighborhood to find out), going to the wrong mall entrance to get picked up and missing our mom, not knowing when she’d get there to pick us up, etc. Letters to Camp is on YouTube! Check out the Solution Marketing Blog. If you're in software marketing, the Solution Marketing Blog is a great resource.